Okay it is absolutely pouring rain outside and I could have sworn that they said that the chances of rain today were nil...."We'll see about THAT," says Mother Nature. Maeve is in the Running! 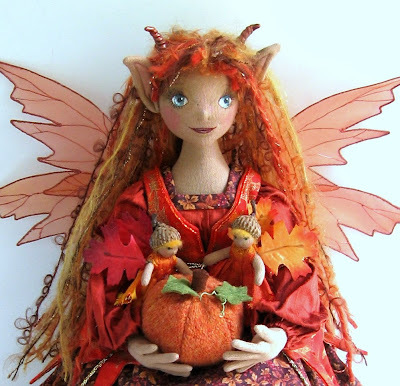 Maeve, my Fall Fairy Queen has been nominated for the Fall Equinox poll on Etsy! How awesome is that? 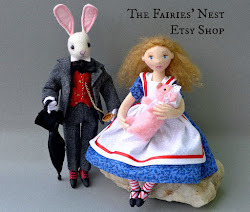 If you have an Etsy account and would like to give her your vote, you can do so here. Wouldn't it be cool if she won?! Hello everyone! Tomorrow is a big day for me...drum roll please...my half century birthday! Fifty!?! It's hard for me to even wrap my mind around the fact that I've been alive for 50 years... it seems such an impossibly short time since I was small enough to ride on my father's back, play house in a big chair (with my sister and two brothers! ), and hide in the tall grass of the field behind our house. And I'm sure it was just a moment ago that my children were sweet little babies and I was a new and fairly terrified young mother. Now they're young men, still sweet but so grown up! Of course it seems that way to my parents too, I was talking to my Dad on the phone yesterday and he seemed astonished that I had the audacity to get this old! 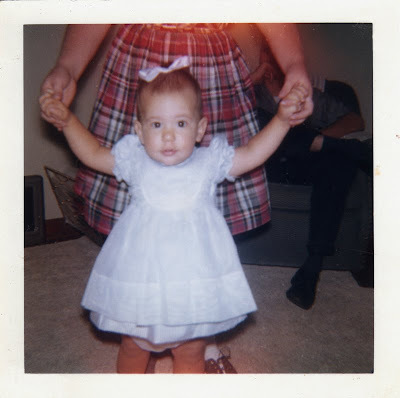 :) I guess in his mind I'll always be his little baby girl with the bow scotch taped to her head. So since it's a nice, round, and rather eventful birthday, I felt that I wanted to share my big day with my friends online. To this end I've decided to have another gift away and hold a drawing for the little birthday pixie at the top of this post. She's holding cake of course...what's a birthday without a bit of cake? All you have to do to enter is simply respond in the comments section of this post and you're in...easy peasy! 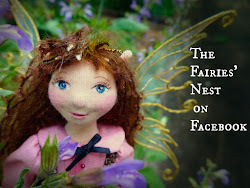 If you are a fan of The Fairies' Nest on Facebook you can leave a comment there as well and be entered twice...if you're not a fan... and why is that? !...you can become one by clicking on the fan button at the top right side of the page. Make sure that you leave some way to get in touch if you don't have a blogger or Facebook profile! I'll throw all the names in a hat and have a drawing on October 1st. That's my youngest's birthday so it seems fitting...maybe I'll even let him pick! It has been so lovely and cool here the past few days that I feel completely revitalized. 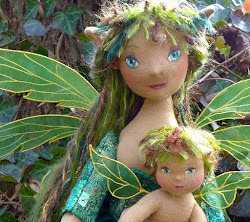 All kinds of doll ideas are popping into my head...now if I can just find the time to make them! And so for your reading pleasure, and because this is after all my birth month, a couple of September poems...Enjoy!